The Celestron Skymaster Giant 15×70 Binoculars include BaK-4 internal prisms and multicoated optics. These features produce improved vision with brighter resolution, which is of top importance for quality binoculars. Included with the Skymaster Giant 15×70 binoculars are a tripod attachment adapter and a soft carrier case. The imagery processing and visibility are top-notch. Celestron Skymaster Giant 15×70 Binoculars’ eyepieces are also excellent. Let’s take a look at the overall power of these 70mm optics. 70mm lens are some of the biggest lenses you can have on handheld binoculars. As a result, you have some of the greatest light gathering power on the market. The diopter settings range from -4 to +8, meaning you can adjust to low or high light situations. Where some binoculars have trouble focusing and can have a tendency to shift, the Celestron Skymaster Giant 15×70 Binoculars have little to no wobble and are equipped with an amazing center-focus apparatus. In addition to this, the Celestron Skymaster Giant 15×70 Binoculars offer high quality eye relief at 18 millimeters, which is great news if you wear eyeglasses. You can adjust the eyepieces by taking the big cap off from the exit or objective lens and then looking through to adjust the focus of the center ring between the barrels until clear. You can do this for both the right and left separately to achieve optimum clarity. These binoculars are lightweight but operate best when they are used with an attached tripod. The Celestron Skymaster Giant 15×70 Binoculars are optimal for a multitude of purposes, including stargazing at both the terrestrial and astronomical level and bird watching. They can be used during the day as well as during dusk. Although the size may make you rather noticeable, the Celestron Skymaster Giant 15×70 Binoculars can also be used at sporting events and concerts. The lightweight nature of the binoculars will allow you to utilize them almost anywhere with very low bounce rate. The Celestron Skymaster Giant 15×70 Binoculars sport a 15x magnification and utilize very large 70 millimeter objective lenses. These lenses also assist in providing maximum brightness for both dimly lit and long-distance conditions. The Celestron Skymaster Giant 15×70 Binoculars have excellent across the field viewing with precise focus. Coated with a rubber protection layer, the Celestron Skymaster Giant 15×70 Binoculars are able to provide users with a no-slip firm grip. In addition to these incredible features, Celestron Skymaster Giant 15×70 Binoculars also come with a no fault warranty which covers protection and support for the product. The warranty includes Celestron’s promise that all binoculars are free from defective material and that they are appropriate for a lifetime of usability. 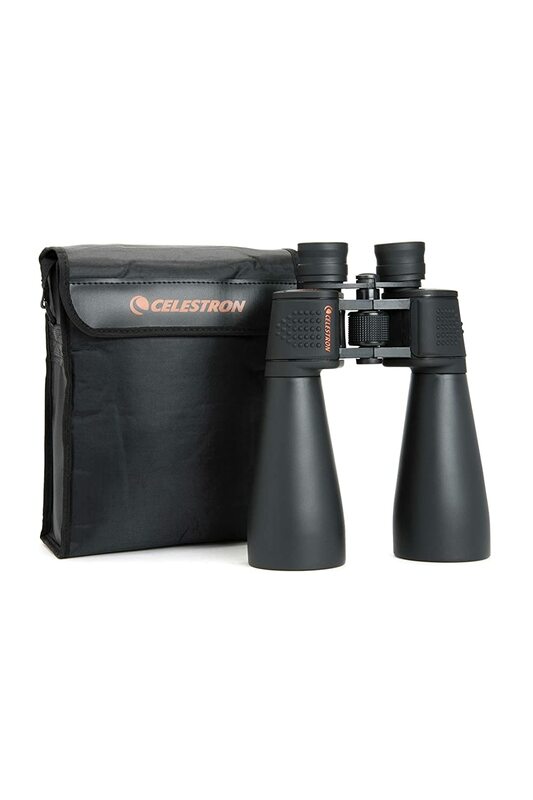 Celestron will replace or work to repair the binoculars if they are sent in, with prepaid postage and a proof of purchase. Celestron will replace or fix the binoculars, regardless of how they were damaged, without asking any questions. The Celestron Skymaster Giant 15×70 Binoculars are one of Celestron’s most popular models in their Skymaster series, due in large part to their tremendous quality and lightweight functionality at such an affordable cost. The Celestron Skymaster Giant 15×70 Binoculars exact specifications include a 4.4 degree angular field of view, 4.7 millimeter exit pupil, the near focus is 43 feet, and the binoculars come with an IPD minimum of 56 millimeters and maximum of 72 millimeters. 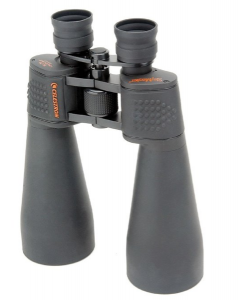 The Celestron Skymaster Giant 15×70 Binoculars come with caps, a strap, a nylon carrier, and a tripod adapter. The Celestron Skymaster Giant 15×70 Binoculars are also water resistant and weigh 48 ounces. These are incredibly high quality binoculars at a very reasonable price that are perfect for the casual user or for those that are more experienced. Whether you plan to take these on a hike for bird watching, check out the night sky for some amazing star gazing, or a myriad of other purposes which require distance viewing, the Celestron Skymaster Giant 15×70 Binoculars are a perfect fit at an incredible value. Since these binoculars are made by Celestron, you can already guess what they’re good at. The moon is one of the brightest objects in our night sky and with the 70mm’s variable diopter settings, you’ll have no difficulty seeing it up close when the sky is clear. These diopter settings work the same during daytime and landscape viewing as well. They come with a tripod adapter as they do weigh about 3lbs free handed. Birding and nighttime sky watching are going to be the biggest and most logical uses for the 70mm’s. 70mm means that you’re going to soak up whatever is giving off light, notably objects in the sky and the moon. These binoculars are big, hence why more often than naught, you’ll see them hooked up to a tripod. They don’t make the best hunting binoculars because they are designed for extreme range viewing rather than detailed viewing. Remember, just because a pair of optics has big lenses, doesn’t necessarily mean you’ll get the best details of an object. Swinging these binoculars isn’t going to be easy due to their size and weight. Compared to wide angled binos and other smaller sporting optics, the 70mm’s aren’t the most logical to take on hunts when you’re lugging them around for hours at a time. Unless you plan to stay in given area, you’re better off using a smaller pair. It’s astonishing to note that the 15x70mm’s aren’t the biggest or smallest pair of binos in the SkyMaster series. Regardless, the 15x70mms sit in the middle of the SkyMaster series and provide astounding images for a cheap price compared to other Celestron products. The 15x70mms don’t have the power to see stars or planets beyond the moon up close and personal but provide a sort of middle ground between mainstream sporting optics and telescopes. Click here to shop the SkyMaster 70mm.